Seba Camp, set in the lush riverine forest in the heart of the Okavango Delta, has two distinctive features: it has been constructed as a family-friendly camp offering parents the opportunity to introduce their children to the magic of the African wild and it is also the base of a most fascinating elephant research project. Seba Camp is a classic safari camp, set in an ancient riverine forest in the heart of Botswana's magical Okavango Delta, offers secluded, luxurious accommodation overlooking a seasonal floodplain and lagoon teeming with animal and bird life. Guests can enjoy more than game viewing, however, the camp is a base for unique research on elephant behaviour and a center for wildlife filmmakers. Seba is located in the beautiful Abu concession and the camp is named after one of the elephants released back to the wild from the nearby Abu Camp. The camp is open all year. Seba Camp is operated by Wilderness Safaris. Seba Camp eight well-appointed and spacious elevated tents, each with en-suite bathroom and a private deck on which to relax and observe the passing wildlife in and around the perennial lagoon. The vibrant décor of each tent celebrates the different tribes of Botswana. Well-lit paths lead to the communal dining area and a lounge-library replete with reference and pictorial books. There is a secluded swimming pool enabling guests to refresh themselves and relax after a game drive. The dining and bar areas are also set on a raised saligna deck with spectacular views. Gourmet meals are served, usually al fresco, in the dining area: five-star cuisine and superb dinners follow cocktails shared by guests, researchers and guides around a traditional campfire. Seba Camp incorporates many features which make it welcoming to families with children. The family suite has two interleading, en-suite double bedrooms. There is ample space for children, including a built-in 'tree-house' for them. An elevated deck has its own small swimming pool and sandpit. There is also an additional family-style tent with two bedrooms, each with a bathroom, private entrance and a connecting doorway. The dining and bar areas are also set on a raised saligna deck with spectacular views. There is also a plunge pool to cool off on hot afternoons. A library is available with a number of reference books and beautiful coffee table books on Africa. Sundowners are around a traditional African campfire. Seba Camp is a year-round, multi-activity camp, offering game drives with experienced guides in open 4 x 4 vehicles during the day and night, as well as walking with an armed guide. When the flood waters arrive, mokoro trips and motor boating are also offered. Bird watching at Seba is exceptionally good. Trained guides are ready to advise on all aspects of the Okavango ecosystems in this, one of Africa's last remaining true wilderness areas. During winter, thanks to the high water levels, Seba is transformed into a water camp, with water-based activities taking precedence, such as mokoro, motorboat excursions and fishing, as well as walks and the usual game drives. The camp is named after Seba, one of the elephants historically released from nearby Abu Camp. As a baby, Seba starred in the Walt Disney movie, Whispers, that was filmed in the area. The word "seba" means whisper in the language of Botswana. A number of elephants that were released back into the wild have formed their own herd. The interaction between these and the wild herds in the area provides rich fodder for research teams from Bristol University in the UK. Guests can observe the researchers at work, often in close proximity to the elephant herds. Guides are always happy to drive visitors to see a released elephant and its wild companions when they are in the vicinity of the camp. Apart from the large elephant population, there is a seasonal abundance of game in the area including giraffe, zebra, impala, wildebeest, tsessebe and lechwe. Lion frequent the greater area and herds of buffalo are occasional visitors too. For bird enthusiasts, some 380 different species are found in the region. Unlike the water-inundated areas of the Okavango Delta, the habitats here vary from open grasslands, secluded island sanctuaries and papyrus-fringed channels. Plains game is abundant in the area, from giraffe, zebra, elephant, impala, tsessebe and lechwe to wildebeest, buffalo and warthogs. Lions often announce their presence during your stay and one can often hear their echoing roars late into the evenings. There is an abundance of bird life found in the area and with over 380 species found in the region, making Seba Camp a haven for all bird enthusiasts and includes such possibilities as Malachite Kingfisher, White-browed Coucal, Luapula Cisticola, Pied Kingfisher, Rufous-bellied Heron and Great Egret. 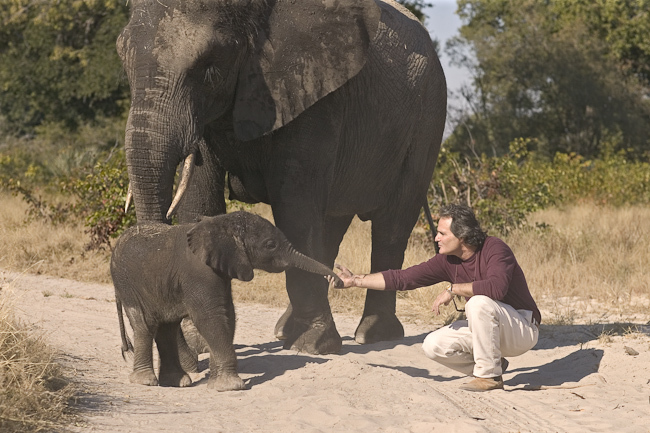 Seba Camp is the base for innovative research being undertaken: Over a period of five years, five elephants from the Abu riding herd have been released into the Okavango Delta with the cooperation of the Botswana Department of Wildlife and National Parks. They have been collared and their daily movements are monitored by researchers who are based at Seba Camp. All the released elephants have been fitted with collars and are being tracked by satellite enabling the researchers to pinpoint their exact locations three times a day. The tracking is backed up by on-the-ground monitoring and observation of their behaviour. The release programme has provided a wealth of material for a research project being carried out by Dr Kate Evans of the Mammal Research Unit of the School of Biological Science at the University of Bristol in the UK and her assistants. This work will help the Botswana government in its management of the country's 110 000 elephants, the largest remaining elephant population in the world.